How is Mitsubishi coping with the yen's rise to record levels? OSAMU MASUKO: There is no way we can get a profit out of exporting from Japan. So we're not able to survive unless we do production overseas or procurement from overseas. We're not thinking about closing any plants in Japan. But there is no way we are going to think about increasing capacity. It's enough that we are protecting what we already have. Mitsubishi Motors Corp. was staging a financial comeback when the automaker was slammed by Japan's March earthquake and the yen's surge against the dollar. 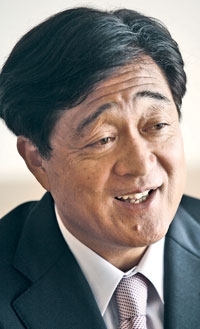 President Osamu Masuko, 62, will have to parry those challenges as he embarks on his grand plan to rebrand the company as a global leader in electric vehicles and plug-in hybrids. The i, an electric minicar, arrives in the U.S. market this month. Plug-in hybrid versions of the Outlander and Outlander Sport crossovers are due in 2013. A hybrid version of the Lancer compact sedan and an electric version of Mitsubishi's global small car also are expected to arrive stateside. One key to the plan will be Mitsubishi's plant in Normal, Ill. The company has killed production of the Endeavor SUV, Eclipse coupe and Eclipse Spyder there to make way for next year's introduction of the Outlander Sport small crossover. It still builds the Galant. Masuko, speaking through an interpreter, discussed his strategies for U.S. manufacturing and green cars with Asia Editor Hans Greimel on Nov. 1. Q: What is your outlook for the U.S. economy and auto market? A: From April to June of this year, we thought that from the second half of this year we would have to increase production. But it became evident that the U.S. economy would recover later than anticipated. This has also to do with the financial crisis in Europe. Then there was the strong yen, which was starting to appreciate. In August, we decided to change direction. What I'm concerned about in the United States is unemployment, which is quite high, as well as housing prices, which are going down and seem like they haven't hit bottom. Mitsubishi's U.S. sales surged 51 percent to 70,253 through October. Where will you end this year? I think the sales volume in the United States is doing very well, especially the Outlander Sport crossover. So we want to keep that momentum. We are preparing for the start of production of the Outlander Sport at our Illinois plant in July of next year. So we're looking at a further increase in terms of production and sales. What is your outlook for the Normal, Ill., plant? Yesterday there was an intervention by the Bank of Japan [to counter] the strong yen. But it seems the strong yen is not going to change for a while. Therefore, the positioning of Normal may change in the mind of Mitsubishi Motors. We're thinking of the United States as an export base. And we are in fact reviewing that right now. Up until now, we planned to produce 50,000 units. But in the future, we're thinking of increasing the production volume to about 70,000 units for the Outlander Sport. We've already implemented efficiencies in the plant, so if we produce 70,000, that will be about breakeven. But we're not satisfied with 70,000 as the breakeven result. So as we launch the Outlander Sport and see if sales go well, we'd like to think about the next step of how to improve our business, maybe by introducing something new to the plant. When will you expand output to 70,000? Next year, there will be only half a year of production because of the July launch of production. So it's going to be around 2014 when we hit 70,000. But just because we accomplished 70,000 units doesn't mean we will only then start thinking about introducing another model. If we have the prospect that we will be able to hit 70,000, then we will start to think about the next step. When we think about such an expansion, we have to strengthen our sales network in the United States. That means from Normal, we are going to be selling into Canada, Mexico, Puerto Rico and throughout Latin America. So we have to think about enhancing the sales network. What kind of new vehicle could you bring to Illinois? First of all, with the strong yen, it is very important that we produce vehicles near the consumer. When we think about the growth strategy of Mitsubishi and increasing production and sales volume, we have to make utmost use of the existing facilities that we have because we are trying to constrain expenditures and investments by as much as possible. The Outlander and Lancer are based on the same platform. But we haven't decided how to move forward with this platform strategy. When we think about the future of Normal, we have to select vehicles that sell well in the United States. What about building plug-in hybrids or electric cars in North America? If we were to manufacture an electric vehicle or hybrid in the United States, it would be unrealistic to bring the batteries from Japan. Common sense dictates we would procure the battery in the United States. So we need the cooperation of a battery supplier in the United States. Are you already talking with battery suppliers? We are using batteries from GS Yuasa and Toshiba at the moment, but we haven't talked with them regarding the U.S. market. We're not talking with U.S. suppliers yet. How many U.S. dealers do you have now, and how many will you need by 2015? Right now, there are close to 400. And I would imagine increasing it by 20 percent. Will you be spending more on marketing in the United States? When we start selling the electric vehicle and hybrids, we have to spend more money on advertising. In order to use more money, of course, we have to earn much more money as well. What will be the impact of the floods in Thailand on Mitsubishi over the next month? There will not be much of an impact on Mitsubishi Motors. I have great expectations this will be resolved by the end of this month. The floods and water won't be resolved by the end of November. But what we hope is that Mitsubishi Motors can resume production [there] by the end of November. Almost all Japanese manufacturers are adjusting down their Japanese manufacturing at the moment because they cannot get the parts. We're all in the same condition. How are the Thailand floods affecting sales or production in the United States? For us the concern at the moment is that we are manufacturing the Outlander Sport in Japan. And right now we are trying very hard to get the supply of parts. Every day, we are trying to balance out the availability of parts and whether we can produce these vehicles. The [affected] parts are integrated circuit chips, the same as in the big Japan earthquake and tsunami. At that time, we couldn't get IC chips from Renesas. This time, it's a company named Rohm. They are not so specialized: [chips that control the] automatic sunroof, transmission, a wide range. Compared to Renesas, the scale is much smaller. How is that affecting production? We are not reducing production volume. We are turning to vehicles with different specifications that don't use those parts. We're also using alternative parts while we wait for Rohm to recover. Is it affecting shipments to the United States? No impact as of now. To what degree are you sourcing more parts from overseas to cope with the yen? Last year, we imported 18 percent of the parts used in Japan assembly. This year it is 21 percent. And by 2013, it's going to be 25 percent. It may look like a slow shift, but the actual monetary amount is quite high: more than ¥1 trillion [$12.8 billion]. Where are you expanding overseas procurement? Where we already have a base of operation -- in China, Thailand or from Korea. We're increasing the amount of parts from Korean suppliers. It has a very competitive exchange rate. What should the government do to help? Even though the Japanese government intervened and started to buy dollars, that's just one time. They have to continue to show strong determination that they are going to intervene whenever there is an appreciation of the yen. I said it at the beginning: One-time intervention is not enough. You have to repeatedly intervene. Even though everyone in our company is making concerted efforts to revive the company, the yen's appreciation is undoing all that work.